Feel like you’re going all out for dinner, when really all you’re doing is throwing an easy meal in the slow cooker for your people! You can combined all ingredients in something like this large mixing bowl, then divide evenly across 4 gallon freezer bags. You’ll have about 2.5 lbs of chicken per gallon freezer bag. 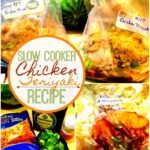 *Special Slow Cooker Chicken Teriyaki directions: about 30-minutes or so before your meal is done pull out around a cup of the Chicken Teriyaki broth. Whisk the broth and 2 tablespoons of corn starch in separate small bowl then pour back in slow cooker. This will thicken the sauce for your meal.